Kai Lenny and Candice Appleby have each performed a clean sweep of the Huntington Beach Pro here in California this weekend. The event, part of the Waterman League’s Stand Up World Series, attracted a solid group of top young guns to one of the most iconic beaches in the world for two days of entertaining racing. Kai triumphed over the usual suspects, with Mo Freitas and Casper Steinfath filling the top three spots in both the distance and sprint disciplines and Connor Baxter finishing fourth overall, while Candice made freakishly light work of the small women’s field where Fiona Wylde and Shakira Westdorp gave her the toughest resistance. Kai and Candice, who are both ranked #2 in the world, seem to be in ominous form right now. Candice didn’t have a huge test this weekend, however Kai was attacked on several fronts by some of the most talented paddlers on the planet. It’ll be fascinating to see if the international superstar (he now has Tag Heuer, Red Bull, Hurley/Nike, GoPro and Naish stickers on his board) can continue his form into next weekend, when the world descends on Doheny for arguably the biggest race of the year, the Pacific Paddle Games (aka the new BOP). Conditions were rough for the 10km distance race on Saturday, with a south wind turning the five-laps of a 2km course into a real grind that featured an upwinder, a downwinder, and a transition through the surf. Kai made a break at the end of the first lap and was never headed, pulling away in the downwind bumps and holding off a very impressive Mo Freitas in the upwind leg. Kai’s biggest rival, Connor Baxter, looked tired but still managed a third place finish, holding off the Danish Viking Casper Steinfath at the line. Arthur Arutkin from France was impressive in fifth, while Tahitian Enzo Bennett showed just how deep his nation’s talent pool runs, looking stealthily quick in finishing sixth. Candice was simply too strong in the women’s. Fiona and Shak went with her early, but the new Infinity team rider pulled away to win by a wide margin. Fiona stayed within shouting distance but Shak faded uncharacteristically at the end to finish more than five minutes behind. Coming home fourth was the up-and-coming Riviera gal Shelby Taylor. On Sunday it was the sprints, with lighter winds and a much shorter course making for a far more entertaining spectacle. Although the field was small – 33 guys and 11 women – the talent was rich and each heat was stacked, particularly in the men’s event. Plenty of big names went out early before the field was whittled down to 2x eight man semi finals. The road to the semis was littered with drama, particularly in the last quarter final when Zane Schweitzer was disqualified for not crossing the line with his paddle. Zane buckled his blade as he hit the sand, which made him instinctively let go of it for the run up the beach. Zane crossed fourth but was soon disqualified. Connor finished fifth and was clearly pissed off with his own performance, letting his emotions show on the beach. However his dramatic day took yet another turn just moments later, with the announcement that Zane was DQ’d. Connor and Zane are such good mates that conbax didn’t event want to take Zane’s spot in the semis, but with Zane officially out, Connor decided to trudge on for the good of the Maui Boys. Slater Trout was the unlucky loser in the first semi. After a horror day yesterday, Slater was one of the in-form guys today but missed a crucial bump in his stacked semi (Kai, Mo, Casper and Enzo got the four qualifying spots) and failed to sneak through to the final. Connor’s roller-coaster continued into the semi-finals as well: After a horror start in the second semi, Connor was sitting in eight (and last) position. These sprint races are on super short M-shaped courses, which doesn’t allow much room to overcome your mistakes. But sure enough Connor found something. As the boys charged in towards the turning flag at the halfway part of the course, Connor was still in last place. Ten seconds later he was in first. Connor held on to book a spot in the final, where he would match up against Kai, Mo, Casper, Enzo, Jake Jensen, Riggs Napoleon and Dylan Frick. But Connor’s ride ended on a down note, with the Starboard superstar finishing fifth in the final. Instead the day, and the entire weekend, belonged to Naish’s megastar Kai Lenny. Kai held off a late attack from Mo, who somehow missed getting onto the bump that Kai surfed to the beach, as well as his team mate Casper, to claim the event and take a stranglehold on the World Series title heading into the final event at Turtle Bay in a couple of weeks. Will Kai be able to repeat his heroics next weekend, when the likes of Danny Ching and Travis Grant enter the fray? On his form this weekend you’d be brave to bet against him, though I daresay Danny is relishing the opportunity to go head to head with Kai on the biggest stage. But back to Huntington: Jake Jensen, who has had a shocker of a year, finished fourth in the sprints to end up sixth for the weekend, while Enzo Bennett capped off his meteoric rise with a sixth in the sprints, which earned him fifth overall for the weekend. In the small women’s field it was once again Candice Appleby absolutely dominating. With world-beating Aussie Shakira Westdorp fighting the flu, it was up to Fiona Wylde to give Candice some competition. The impressive youngster Fiona stuck with Candice for the first three quarters of the final, but Candice’s knowledge of the waves carried her home to the race win, the event win, and the overall 2015 World Series title. 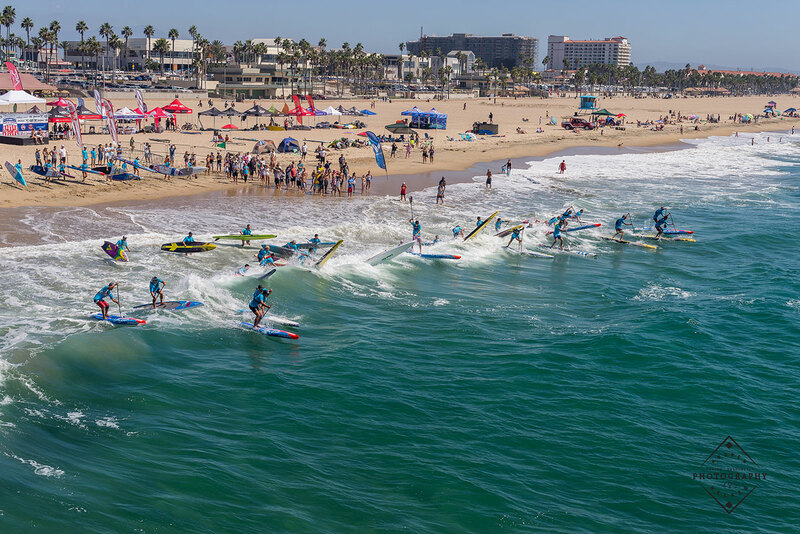 It’s been an interesting year for the Waterman League and their two major franchises: The Stand Up World Series (racing) and Stand Up World Tour (surfing). The surfing tour became a complete farce after almost all the events were cancelled, with the women’s world title being decided on only two contests and the men having just three. The racing (World Series) fared slightly better, however there were still major race cancellations in Abu Dhabi, Germany and Brazil, which shortened the season to just four races instead of seven. But despite the annus horribilus for the Waterman League, their leaders are, once again, talking up a big game for the new year: At the athlete’s meeting last week, head honcho Tristan Boxford proclaimed that each event in 2016 would offer a $50,000 prize purse, with the promise that outside investors were going to reinvigorate the tour with a big round of financing. Considering that some athletes still haven’t been paid from the Waterman League’s surf contest at Sunset back in February (that was seven months ago) as well as their event in Tahiti four months ago (and who knows how long athletes from this weekend in Huntington will have to wait – paddlers were told this afternoon not to cash their prize winning checks just yet), I’m a little skeptical they’ll be able to double their prize money next year. Credit where it’s due though: The Waterman League are one of the most resilient groups in the sport. This is the fourth year of their World Series (racing) and their World Tour (surfing) has been going for more than five, and they’re still rolling on despite all the setbacks and screw-ups. I was down at the beach in Huntington today and I’ve gotta say the racing was genuinely exciting – some of the best I’ve ever seen – at least in the sprints (they could probably do away with the distance races). Hats off to the webcast crew as well, who put in a fine production that surely entertained the fans watching around world. So yeah, the Waterman League… Bit of an enigma. Bit of a mystery. Who knows what will happen next year: They may finally give their house of cards a solid foundation, or they may finally implode under a burden of debt and broken promises. Either way one thing’s for sure, these guys aren’t gonna die wondering, for which they deserve some respect. And until then, we get to enjoy watching the likes of superstars Kai, Connor, Casper, Mo and co do their thing, for which we should be thankful. Anyway I’m going off on a tangent here. Results are below. The women’s field was a little light this weekend but the men’s was pretty stacked. 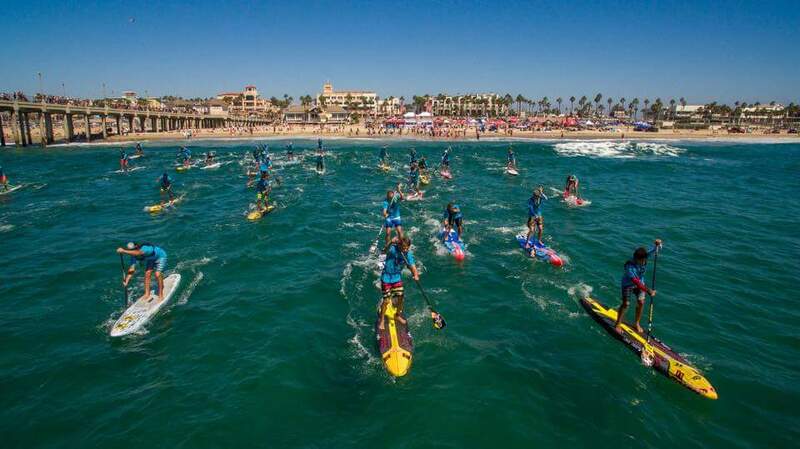 That means the Huntington Beach Pro should give the SUP Racer World Rankings – Top 100 Leaderboard (and the new Battle of the Brands) a solid little nudge. Early calculations peg the men’s race at 48.0% and the women’s at 27.0%. We’ll update the World Rankings in the morning. There’s actually going to be a massive change to the Top 100 Men and Top 50 Women Leaderboards tomorrow morning: Apart from Huntington, we’ve got the 2014 Battle of the Paddle being finally dropped from the system, which will totally shake up the top placings (spoiler alert: There’s going to be a new world number one). It’s the BOP-pocalypse. 30 Nainoa David 33 25 1.92 Tahiti ? 33 Jeffrey Spencer 33 31 1.63 USA ? 34 Rangitea Bennett 33 33 1.44 Tahiti ?